Do you struggle with clients not understanding why certain veterinary services and procedures cost what they do? If so, be sure to use MVMA’s "Cost of Compassion” brochures. Members may request an initial supply free of charge. Clinics with 100% doctor membership can request a free supply every year. Do you struggle with knowing how to respond when clients ask about pet health insurance? 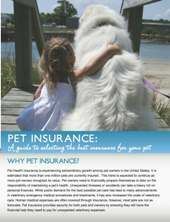 If so, be sure to use MVMA’s "Pet Insurance: A Guide to Selecting the Best Insurance for Your Pet” brochures. Members may request an initial supply free of charge. Clinics with 100% doctor membership can request a free supply every year. Let the MVMA save you time and money by providing you with valuable client feedback for free. We will provide you with surveys to hand out at the conclusion of appointments. MVMA will then collect and tally information providing you with an electronic summary.